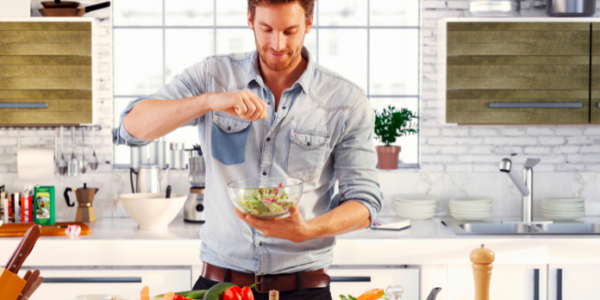 A great way to ensure you’re eating healthy is by preparing meals yourself. When you do your own cooking, you know exactly what ingredients are going into your meals. But what do you do when you’re in a hurry or don’t have a lot of time during the day to prepare nutritious meals yourself? Add water and the oats to a pot. Cook while stirring over high heat for 5 minutes or according to the package instructions. Top with the blueberries, chia and sunflower seeds. Drizzle with the agave nectar. Enjoy! In a medium saucepan, toast dry quinoa for 2 minutes over medium heat. Add water and bring to a boil. Reduce heat, cover, and allow to simmer for 12-15 minutes until quinoa is tender and tails have popped. Drain if need and place in a bowl. In the meanwhile, toss pumpkin and sunflower seeds a hot pan for 3 minutes with a teaspoon of coconut oil. Add seeds to quinoa. Add chopped parsley and chopped celery to quinoa. Season with black pepper and Himalayan salt. Add juice from a freshly squeezed lemon. You can also add avocado. Enjoy! In the pressure cooker, heat oil over medium heat. Add onion and sauté for about 2 minutes. Add carrots and sauté for another two minutes. Add the bay leaves, thyme, lentils, potato, and water or broth. Stir well. Lock the lid of the pressure cooker and bring mixture to a boil over high heat or until you achieve high pressure. Reduce the heat to and cook for 10 minutes. Remove pot from heat and let the pressure come down naturally. Remove the lid, tilting it away from you. Remove the bay leaves and thyme stems. Add salt and pepper only if you did not use soup powder. Enjoy! Prepare quinoa as in recipe # 2. When quinoa is ready, add beans and salsa, stirring gently to combine well. Cover and cook for 3 minutes until dish reaches the desired temperature. Fold in pumpkin seeds and serve on a bed of lettuce leaves. Enjoy! Preheat oven to 180°C (375°F). Open the tortilla or pita and spread beans on top. Let them bake for 10 minutes and remove from oven. Add mashed avocado on top of the beans, sprinkle with chopped tomatoes, and add lettuce on top and dash with a squeeze of fresh lemon juice. Enjoy! Fry garlic in coconut oil in a pot. Peel and cut sweet potato and butternut pumpkin into chunks and place in the pot. Add orange lentils and water or vegetable broth, and spices. Cook for about 15 minutes. Presto, a deliciously healthy and quick meal. Place spaghetti in a large pot of boiling water. Cook for 5 minutes or according to the instructions on the package. In a large frying pan add the chopped garlic and sauté for about 1 minute. Add the parsley, olives, capers, oregano, sun-dried tomatoes and the red pepper flakes to the frying pan, and sauté for 2 minutes more. Add the tomatoes and cook on low heat for 10 minutes. Stir in the arugula and simmer for 1 minute more, until the greens wilt slightly. When the spaghetti is ready, drain well and add it to the frying pan, tossing it with the sauce to combine. Enjoy! Place spaghetti in a large pot of boiling water. Cook for 5 minutes or according to the instructions on the package; when ready, drain well. To make the sauce, fry the basil and garlic in coconut oil for 2 minutes. Squeeze the lemon juice on top, and season with salt and pepper. Add mushrooms and peas. Toss for 5 minutes. Add almond paste. Fry for one more minute. Enjoy! Fry onion in coconut oil, add cauliflower, salt, pepper and tamari sauce. Stir and cover frying pan. Cook for 10 minutes on medium heat. Serve with brown rice. Enjoy! Combine all of the ingredients in the hand food processor bowl. Stir continuously for 2 minutes Let the mixture stand for half an hour. Serve and Enjoy! Combine all ingredients in a large bowl. Enjoy. Feel free to comment below and let me know what you liked best about this article. Thank you for taking the time to read this. I’d be honored if you would share it with your family, friends, and followers by clicking the Like, Tweet, and Share buttons. If you are serious about improving your health no matter what your age or circumstances, and are ready to finally achieve optimal health and lose the weight you’ve been struggling with, then click HERE to check out my online Guerrilla Diet Bootcamp for Healthy and Lasting Weight Loss. If you are not already on my mailing list where you will receive my weekly articles packed with scientifically based health, and nutrition content, as well as many FREE bonuses and special offers, and much more, then click HERE to subscribe. How Much Meat is Really Healthy? Are you serious about improving your health no matter what your age or circumstance? Spirulina – should you supplement? Lectins, dangerous for health or not?